The Mario Kart series started on the SNES, and it has since become one of Nintendo's best multiplayer options, right alongside the likes of Smash Bros and Mario's many sports outings. With that in mind, Nintendo coded up another Kart game for their highly successful DS system. They could have easily coughed up a Mario Kart that comfortably rode the coattails of its predecessors, but instead they went above and beyond and made one of the best Mario Kart titles yet. When the player fires up the game, they are greeted by a menu screen (innovative). The first choice is single player, and it's first up to review. Upon tapping single player, the player can choose the standard Grand Prix, Time Trial, VS (basically a quick race), and battle modes, with the new addition. Before we delve into the modes, it would be best to give a brief overview of Karting for the benefit of those who haven't picked up a pad since 1989. 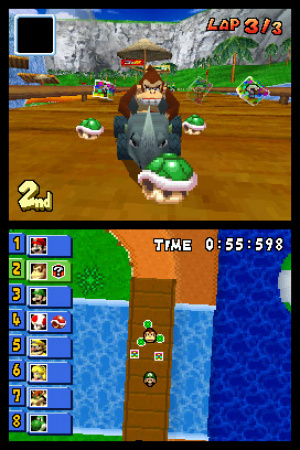 In Mario Kart, Mario and company race around in character-themed courses while throwing Koopa shells, bananas, Bob-ombs, and other hazardous items at each other in a brutal attempt to win. Everyone's welcome as Mario, Luigi, Peach, and Donkey Kong inexplicably call for an armistice with Bowser, Wario, and the Koopa Troop for a relaxed go-kart tournament. Rubber is burnt in every imaginable locale as well: the crew will race along standard tracks, curvy mountain roads, Isle Delfino, a pinball machine, Luigi's Mansion, Bowser's Lair, and of course, the classic Rainbow Road. But no Nintendo game would be complete without nostalgia, so Nintendo kindly updated a select 16 classic tracks from every previous game so that you might relive your glory days on the SNES Mario Circuit 1 and the GameCube's hectic Mushroom Bridge. For new players, this is not as interesting a feature, but all should agree that the old tracks work quite well even with new abilities and items. The Grand Prix mode offers eight total cups (four of which borrow tracks from the previous games) with three difficulty levels. When the race begins, players fire up their engines and go. Players can draft, drift, boost, and throw items in an attempt to be number one, and the racing is as fun as it ever was (in spite of/thanks to absent touch controls). While the AI can get a bit unfair on the hardest difficulty, it rarely matters because the racers farthest back get the best items. 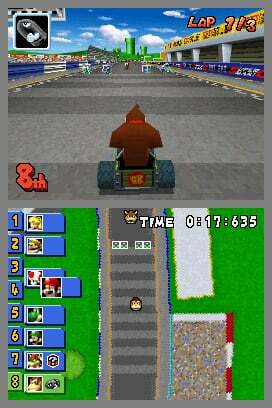 If the player gets Gold in these events, he or she will unlock various karts and characters for their efforts. Time trial needs no explanation: just race alone for the best time on any track, and your best times can be shared between friends for those seeking a little competition. 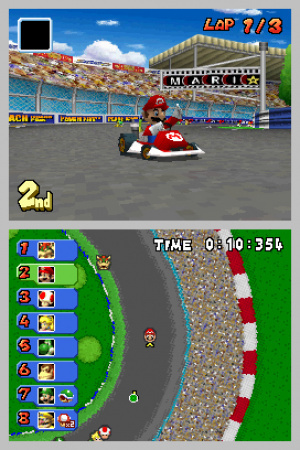 VS allows players to quickly race a track or two against the computer, which, surprisingly, was a new feature at the time of MK:DS's release, and one that lends itself to a handheld game due to its pick-up-and-play nature. The series' popular Battle mode returns, seeing players race around enclosed arenas and use the game's various items to attack each other. It has two game types: Balloon and Shine Runners. In Balloon Battle, the player has a set of balloons which act as a lifeline. Every hit sustained will result in a lost balloon, and players must blow into the mic to inflate another. Run out, and you lose. In Shine Runners, players zip around to pick up shine sprites so they can stay alive. Contestants are periodically eliminated based on lowest score until the last man (or team) standing wins. Both modes are fun, but the AI's a bit on the easy side. The new addition is Mission mode, which pits various characters in random missions such as crushing boxes or doing X number of power slides in one lap (a mechanic that will be covered more later). Once all of the missions in any particular section are completed, the player can take on a boss, which is actually quite fun. That said, the mission mode is a little short, but it certainly adds to the single player offering. Overall, the single player is probably the best of any MK so far, even if the AI is unpredictable. 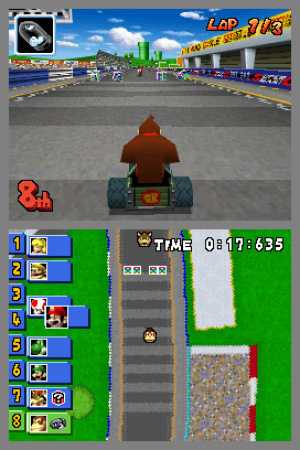 Mario Kart is all about multiplayer though, and Nintendo knew that, allowing players to play locally and for the first time, online. Locally, players can race or battle on any track or course... assuming they both have the game. If you have to download, only a limited selection can be made, but it's still good fun for up to 8 people, and multi-card or download notwithstanding, homing-shell revenge is twice as sweet against real people. Online play is a blast, but battle mode is not available. Players can play against their friends or strangers, and races tend to get started rather quickly. Unfortunately, being Nintendo's first try, the online is limited, with no voice or friend requests to strangers met in races. The biggest problem, however, is snaking. Snaking is a technique which involves using power slide boosts (previously mentioned) through the entire race. It gives advanced players a distinct advantage, and it can eliminate any fun to be had by novice players. That said, online play is a great addition to Mario Kart, and it is still fun to play even against the likes of Mario Kart Wii thanks to better item balancing. Now that all of the gameplay options have been mentioned, what of the graphics and sound? They both check out quite nicely, especially for early DS titles. The racing clips along a great pace with no hiccups, and all of the character models look good and animate nicely. The retro tracks all look and sound better than ever, which makes them feel like they were made for the game, making them an even more welcome addition. Those with a little artistic flair of their own can even design their own decals to place on their kart and show off online. All of the crew's voice files, if a bit repetitive, are on cue and clear. There's very little to complain about; the music is catchy, and the graphics are pretty, enough said. In short, despite some minor shortcomings like weak AI and button-heavy controls, Mario Kart DS is great. The sturdy single player packaged coupled with potentially endless multiplayer fun online and with friends makes Mario Kart DS an incredible deal and proves just what Nintendo is capable of with online play. As it stands today, Mario Kart DS is the best Mario Kart out there, and you would be hard pressed to find a better racer on the DS. It certainly deserves that 9, quite a great game. I'm surprised it took so long to get a review on here. We're looking at covering more and more classic titles that we didn't get around to reviewing when they came out. Remember that NLife in its present form has only existed for the past year or so; prior to that we didn't have as many staff on the books, which is why some games slipped through the net. The sales speak for themselves, first online Nintendo game, what an exciting time. Millions of Nintendites funneling into one game after waiting so long. @Damo - Fair enough, I can understand that. It surprised me as I thought It'd already been reviewed on here. I just wish Nintendo would lower their prices every once in a while Still 35 dollars where I live and I think it's that way on Amazon to. "As it stands today, Mario Kart DS is the best Mario Kart out there - 9/10"
There aren't many other Nintendo games this generation that are the best in their series, are there? Best Mario Kart ever IMO!! Should have been 10/10. Damo, hasn't NLife only been around since the launch of the DSi, a couple of months ago? I agree. This is the best MK game, closely followed by the Wii version. @dimlylitmonkey - I'm not sure if you were being sarcastic, but I think Galaxy is an easy bid for first in the Mario series, perhaps only behind World or Mario 3. I love this game, it's an online endless experience!! It was fun for a short while, but the turning and drifting is too easy to master - it lacks the hectic feel of the other Mario racers. I completed all the cups and GPs in a short time, and haven't enjoyed it since. This site has been around since 2005. Maybe 2006, i'm too lazy to check that out. This game is definitely NOT better than Twilight Princess. I've played Mario Kart DS to death!!! I went through and unlocked all the characters, all the modes, the new title screen and some staff ghosts. Plus I ride the bus with a couple of friends and we play Mario Kart all the time on the bus. In '06 it was VC-Reviews I believe. I'm sure NLife has only existed since the DSi launched? Spot-on review. This is my favorite Mario Kart to date. So much fun to be had with it. This game still gets use out of me. @Josh "I just wish Nintendo would lower their prices every once in a while Still 35 dollars where I live and I think it's that way on Amazon to." While this might be good for other games, it'd be stupid to do so for this one. MK DS is one of their longest best-selling games for the DS. The great thing about that is that the number of online players doesn't dwindle like in most other games. I agree with the review. Best MK this far. I actually think Mario Kart Wii is the best one, followed closely by Mario Kart DS. @Homer - Nlife was around in 2005 but didn't have as wide a readership as it does now since the popular VC Reviews and WiiWare World were brought into the fold earlier this year. Now we're operating as one combined site we're trying to make up for the sins of the past and cover key reviews such as this. I disagree that this is the best version of the game. IMO, MKWii is the best, since it provides more of a challenge (the DS one is WAY too easy), a much better online mode and a much improved speed boost system rather than snaking. Seriously, you think a plentitude of items floating around, constantly harassing you, is a fun challenge? No, thanks. Now you get a review of this game? took waaaaaaaaaaaaaaaaaaaaaaaaaaaaaaaaaaaaaaaaay longer than expected. Don't care for any of the others. "despite some minor shortcomings like weak AI and button-heavy controls"
...Button heavy controls? It's a kart racing game, not a point and click adventure. I love this game. I got my copy with the limited edition Mario Kart DS. Have been playing it ever since. @mjc0961 - I meant it doesn't use the touch screen, which isn't necessarily a problem, just a fact. I hope for a Mario Kart DS 2 or Mario Kart DSi. I haven't really decided whether I like Mario 64 or Galaxy better (I tend to think of the 2D Marios as a seperate series). This is easily the best game in this crappy series. Yet I hate it just like the rest of them. @dimlylitmonkey - You nailed it, I completely agree. Nintendo had to dumb it down for us Yanks and just call it Mario Strikers Charged, but yes, I agree. When it came out I preferred Tony Hawk's American Sk8teland. The online play for it seemed better and (at least at the time) less prone to cheap tactics such as snaking. Both are great games though. 10 of 10s should be rare things, since it is hard to reach perfection. 9/10 is a good review. Hey wait, Clayfrd writes articles for NL? !O_o Huh, I never knew that. mario kart double dash is my favorite. but i have never played the ds version in single player mode though. i wish you weren't a shy guy though. My first DS game, and probably my favorite. This was my 2nd DS game and perhaps my favorite. wWell at least until Mario and Luigi: Bowser's Inside Story came out, the only con about this game is its lackluster online play, but then again I don't expect much from Nintendo Online. 7!?! NO!!! 9999999999999999999999999999999999999999999999999999999999999999999999999999999999999999999999999999999999999999999999999999 AT LEAST! cryptonic, how likely would Link ride kirby? He would pop him with a boomerang. sonic and sega all star racing is way better. your character goes way to slow in this game! Well, when playing it on a 3DS it might be less button heavy with the circle pad. Really good game, the only problem is that there is really nothing much to do once you do every single grand prix track. Also, I don't really like the way Donkey Kong looks. But otherwise a really good game. This game is my favorite DS game of all time. I could play VS with the CPU on hard forever, switching between 150cc and mirror mode and setting the track choice on random. Awesome game!